The Feature content type is a way to highlight content on your site. You can use the Feature content type in the main content area or in the Content Below Main area. Navigate to your page and click Edit. In the Content section, select the radio button for Feature, and expand > Content. Internal/External Link: If you are using an Internal Link, click Choose File, Page, or Link. In the Chooser Panel, you can select a recent internal page, or browse for an internal page. If you are using an External Link, enter the URL, including the http://. Text: Enter text for your feature in the WYSIWYG editor. Click the Add Image checkbox to add an image to your feature. The image must be 735 x 490 pixels. Sample text: A Brandeis education is a vigorous exploration in critical analysis, creativity and self-expression. Our faculty combine innovative teaching with groundbreaking research and scholarship. Immerse yourself in the liberal arts and sciences, and engage in research that excites you, with faculty leaders in their fields. Select the radio button for Feature. For Background Color, leave as beige unless you have multiple Content Below Main modules, in which case you would want to alternate colors for contrast (you can edit this later). 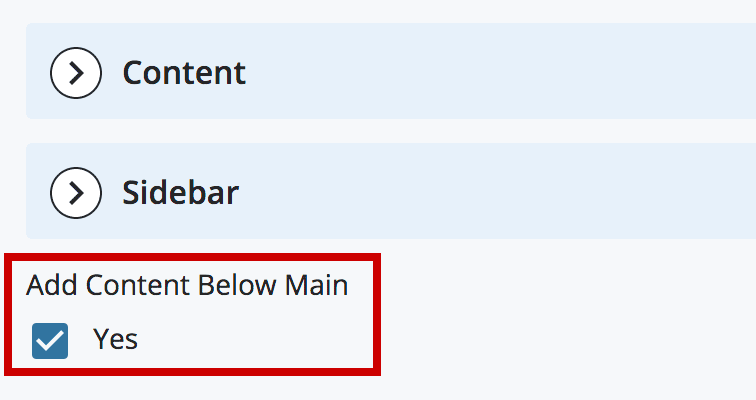 The fields for the Feature in the Content Below Main section are the same as those for the main Content area with a few exceptions. You can add a Video URL and Transcript. This will link the image to a video that will open in a modal window. The Image field is required.